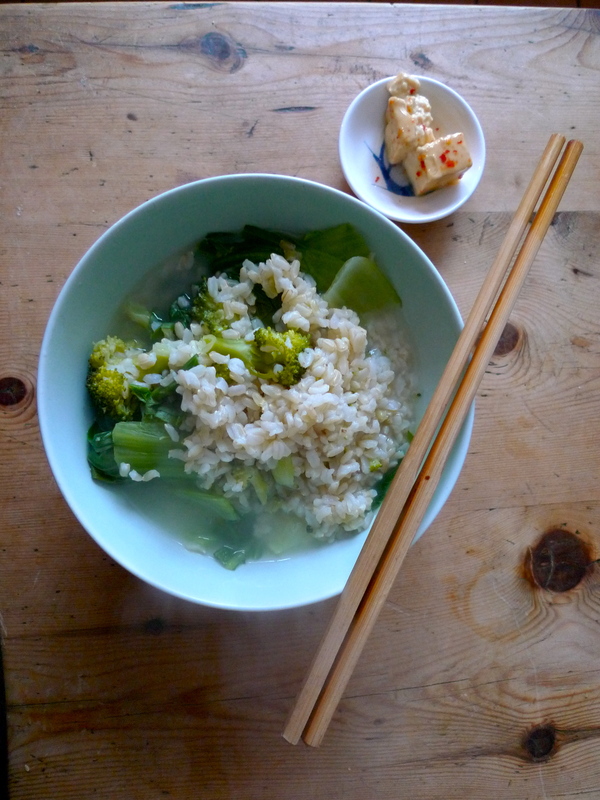 The picture on the left is of my lunch yesterday, at home: pao fan 泡饭 (‘soaked’ or soupy rice) made from leftovers of brown rice with broccoli, with added green pak choy, and some spicy fermented tofu. You could say it was the most basic, skeletal epitome of the Chinese meal: a staple grain, some healthy brassica greens, a little protein (the tofu), and a strongly-flavoured relish to ‘send the rice down’ (xia fan 下饭) (in this case the tofu again). It was just what I felt like after a few days of rather gluttonous eating over Easter: plain, cheap, healthy and nutritious but also rather nice. The privileged among us really do live in one of the golden ages of eating. Like rich Romans of classical times, who served peacocks at their banquets, or the upper classes of Tang Dynasty Chang’an, with their predilection for Silk Road spices, we can pick and choose what we consume; we can have Sichuanese food tonight, Italian tomorrow and Japanese the day after; we can buy fresh uni, fennel pollen and verjuice; we can eat meat at every meal, or decide to become vegetarian for intellectual reasons. 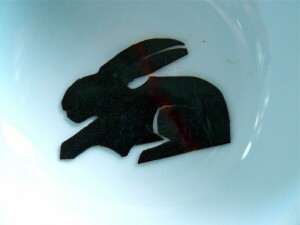 We can fuss over the provenance and purity of our coffee and chocolate. We can throw away vegetables that are a little wilted, or good food that we simply forgot to cook because we were out at some fancy new restaurant. Our biscuits are double-choc or triple-choc, our ice creams are threaded with extra nuggets of luxury. The world is our oyster. Such decadence is always a privilege, and more precarious than it might seem. It’s impossible not to think of this in the midst of a raging recession, and, even more seriously, a period of mass extinctions and unstable weather. And that is perhaps why, lucky as I feel to be part of the British Established Middle Class (according to the new survey!) in this era of rich and varied eating, and satisfied as I am with the kou fu that comes with my job (kou fu 口福is a wonderful Chinese phrase that means ‘the good fortune to happen upon delicious food’), I try not to forget that eating well is a privilege, and that rice, cabbage and tofu is enough for an everyday lunch. 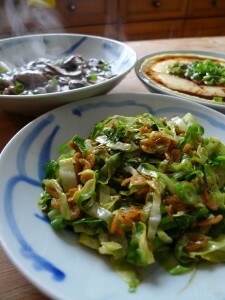 Of course the great thing about Chinese cooking is that modest, cheap meals can be so extremely delicious and satisfying. I’m a great fan of fermented tofu, which has such an electrifying flavour that it really can enliven the taste of a bowlful of plain rice and vegetables (lao gan ma 老干妈 chilli and black bean sauce and gan lan cai 橄榄菜 ‘olive vegetable’ are two other scrumptious relishes). 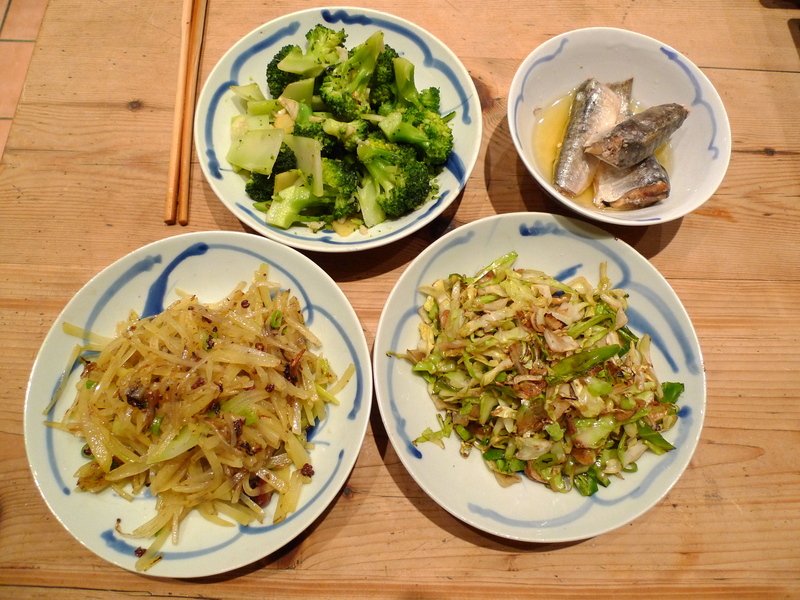 Some pickled vegetables, a spoonful of dried shrimps (see my last blog post), a few chillies, or a single slice of streaky bacon – all these can make the plainest, cheapest foods taste amazing. And rather than meat, why not have with your rice or noodles a single egg, fried both sides and finished with a streak of soy sauce? Above you’ll also find a couple of other pictures of simple lunches I’ve had in the last week or so. Both meals took about half an hour to prepare. 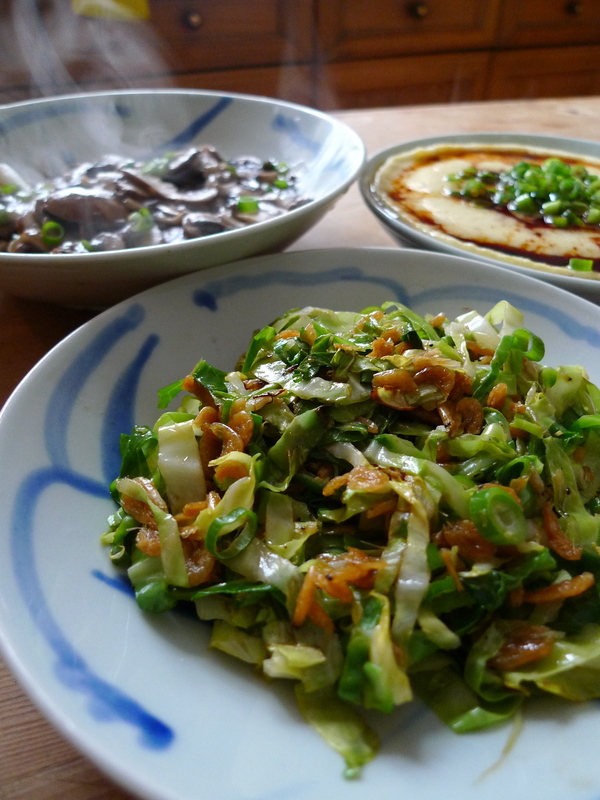 On the upper right you can see some stir-fried spring greens with dried shrimp, with steamed eggs and stir-fried mushrooms – I cooked the mushrooms in a little duck fat I had in the fridge, with garlic and spring onions. I was pleased because a (Taiwanese) friend who had come over to fix my kitchen door, and who had politely declined an offer of lunch, was simply unable to resist the cooking smells and ended up sharing everything with me, very happily. 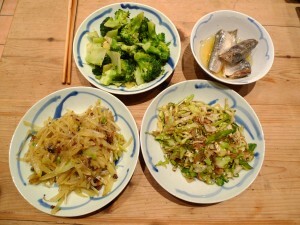 And on the left is a meal I rustled up on a day when there didn’t seem to be any food in the house: the end of the spring cabbage I cooked for the first meal, again with a few dried shrimps, one tiny leftover head of broccoli (including the stalks, peeled and sliced) with ginger and garlic; two potatoes slivered and stir-fried with chilli and Sichuan pepper; and then a tin of sardines because I was particularly hungry! I make no apologies for the careless presentation of the dishes in the pic on the left, but this was a quick fix on a busy day, and I wanted to show it exactly as it was – basic, but delicious. 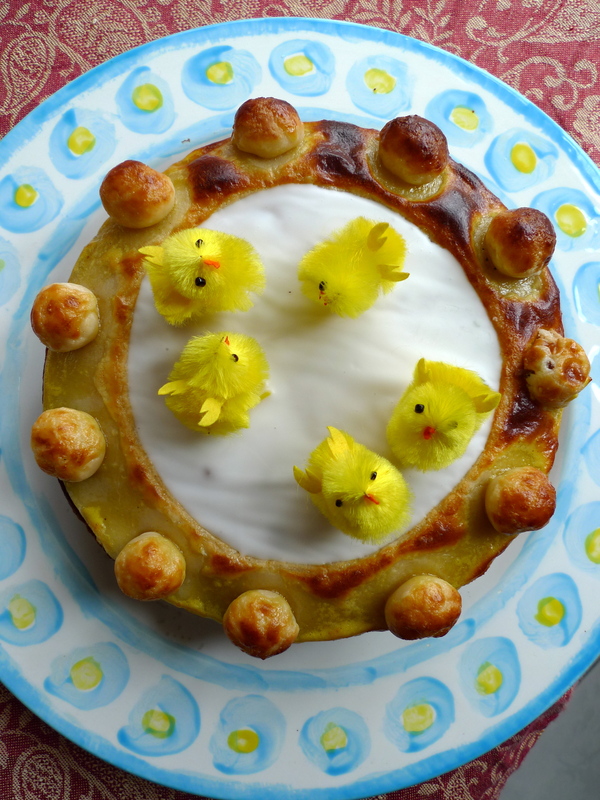 And there’s also a pic of some of the Easter feasting – namely my first Simnel cake (! ), and an Easter rabbit I cut out of Iranian fruit leather at my small niece’s request (she’s obsessed with rabbits). Why do Americans think ice is so nice? I bet you like ANCHOVIES! Seems strange but peppers were easier to grow in SEATTLE, WA. than here on MARS! I hear that scorpions are good on the grill….But I haven’t tried that yet….Perhaps white pepper and garlic? Yes, I do like anchovies! I usually have some anchovy paste in the fridge, to eat on buttered toast, and I like stuffing anchovies into a leg of lamb for roasting, or eating them with lazily grilled red peppers and capers. I think I need to get a copy of your book, for some perspective. You will help make this world a better place! Thanks for this thoughtful post, Fuchsia. For supper yesterday, I made a very satisfying dish of fried rice with odds and ends found in the fridge: a handful of mange-tout peas, a couple of carrots, some cooked petit pois, spring onions, and an egg. It was delicious with a large spoonful of chili pickle on the side. I’d be really interested in making my own pao fan. Do you know any good recipes? p.s – on the above comments – Are you being trolled? Pao Fan also reminds me of something I had in a Japanese restaurant – rice in green tea with pickles. It was delicious. I’m diabetic, so don’t eat white rice more than once in a blue moon (sob) and only basmati at that. However I allow myself two lots of brown rice a week. One portion hot with whatever’s in the fridge, and the other cold added to a pretty traditional but extra-liquid ratatouille. Gorgeous. Leftover brown rice also makes a good base for a crispy-skin rice cake with other leftovers plus a herb or two and whatever takes your fancy. Pao Fan is totaly different than Japanese restaurant one – rice in green tea with pickles. I think Shanghainese Pao Fan is the best. It reminds me of my mum’s delicious home cooking.